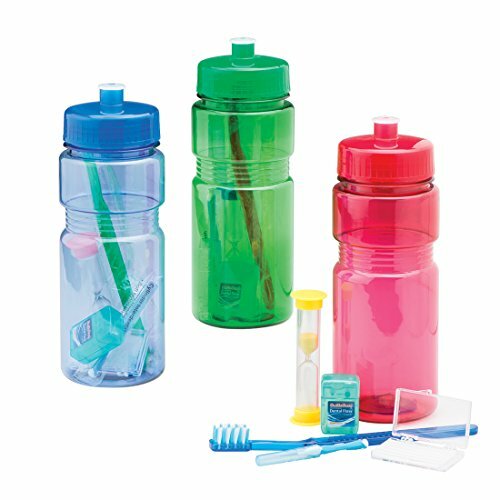 Get the best value with our SmileMakers Water Bottle Ortho Kit! Includes an Orthodontic V-Trim Toothbrush, 12 yards Waxed Mint Floss, Orthodontic Wax, Travel Interproximal Toothbrush, Two-Minute Brushing Timer and a sports water bottle with a push pull lid. Comes with an assortment of red, blue and green water bottles. 8" water bottle. 144 per unit. If you have any questions about this product by SmileMakers, contact us by completing and submitting the form below. If you are looking for a specif part number, please include it with your message.